After shopping around for a new ultrabook, I finally settled on the Lenovo Yoga Pro 2. It features a 3200x1800 screen, 8 GB RAM and a 256 GB SSD, all weighing in at just over 3 lbs. The Yoga design allows the screen to rotate 360 degrees so that you get a (albeit hefty) tablet mode as well. 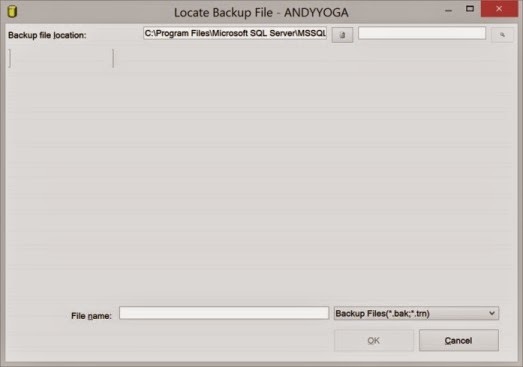 So, I thought I would share my solutions to some common annoyances that other developers will have with the Yoga. I have heard a lot of complaints about the trackpad on the Yoga 2, and I have to agree that its gesture support just gets in the way. I would become really frustrated inside Visual Studio when trying to drag items around or use right-click context menus - whenever I tried to right-click, the mouse would move just a little bit off target before the click registered. So here is what I did to make the trackpad a more "basic" experience, removing the gestures. In the Search box, enter "mouse"
Now you will see the Synaptics Control Panel. Be sure to visit all three tabs here and uncheck all of the annoying gestures to your needs. The top row of keys on the Yoga hav e both "function" keys and "utility" keys (for example, media controls, airplane mode, etc.) The default for these keys is to invoke utility keys when pressed, and as a developer you most definitely want the Function keys to be the default. 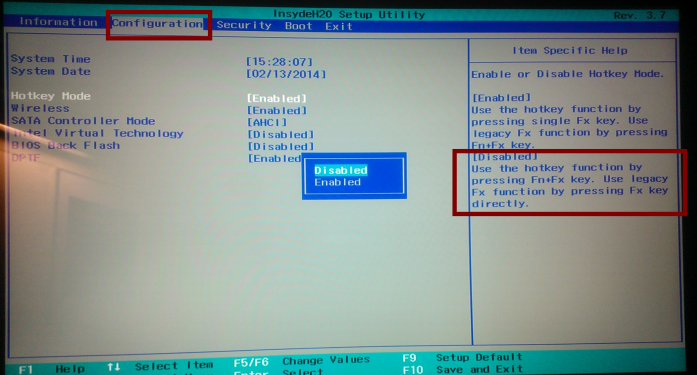 Here is how to change the default to Function Keys. Shut down your Yoga 2. On the right-side of the Yoga, right next to the power button is a small circular button with a little "refresh arrow" right next to it. You need to depress this tiny button with a small screwdriver or any pointed tool. 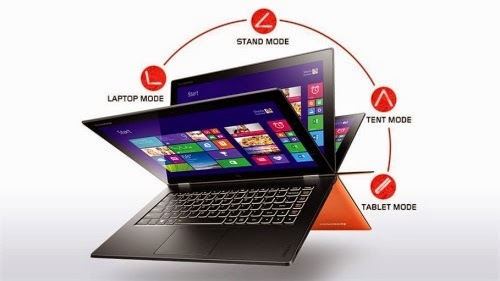 The Yoga 2 has a light sensor which automatically brightens or dims the screen depending on lighting conditions it is in. The problem is, you will sometimes be in a light condition where the screen will flicker rapidly because it can't settle on a brightness! You can, however disable the auto brightness. On the task bar, click the little battery icon at the right-most part of the task bar. 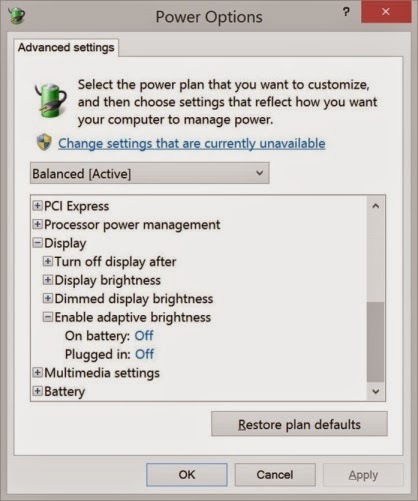 Select "change advanced power settings"
Screen Shots are HUGE. If you're used to taking screenshots or video, be prepared for huge files. The Command Prompt... Another window that comes up very tiny. You can set the font sizes in the window properties, but in my configuration and font selection I am not able to get it to a comfortable viewing size. The only fix I have found for these issues is to kick down the Yoga's resolution when needed - for example, if you're doing some Camtasia recording, it might be a good idea to lower the res before doing so. If you're a developer and considering the Yoga 2 Pro, I would recommend checking out the numerous reviews from Engadget, CNET, and others. And while you will likely hit the same quirks as I did above, you sho uld be able to make these tweaks to improve your experience. I have so much regret of buying this PC, its the worst computer/ the most expensive i bought in a long time, and I would never recommend it to any one.